Analogy were a German group living in Italy in the late 60s that featured Jutta Nienhaus on vocals, Hermann-Jürgen "Mops" Nienhaus on drums, Wolfgang Schoene on bass, Martin Thurn on guitars, flute and bongos, and Nikola Pankoff on keyboards (mainly Hammond organ). 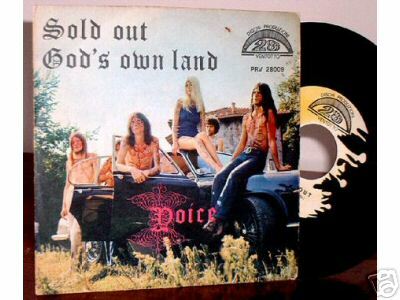 Under this moniker, they really released only one album, the self-titled Analogy (1972), though in 1980 The Suite was released featuring Thurn and Jutta Nienhaus along with members of their subsequent band Earthbound – it was released on CD in 1993 by Germany's Ohrwaschi label (and later in a bootlegged 10" vinyl format by Akarma in 2000). Nienhaus and Thurn and original bassist Mauro Rattaggi gathered others together to record old and previously unreleased Analogy pieces as well as re-record pieces that had appeared on their first 7" singles for a CD called 25 Years Later that was released by Ohrwashi in 1996. The booklet of this 2002 reissue of Analogy from the Garden Of Delight's label details the band's history both before becoming Analogy, when they were known as The Joice (and later, due to a misprint Yoice), through to their post Analogy days. As usual, there are photographs, discography, as well as sleeve and label covers reproduced in the booklet. This is, according to GoD, the first legitimate CD release, as the history includes details on unauthorized and bootleg editions (e.g., Akarma), and was made from the master tapes. Analogy's sound is thick and heavy in a psychedelic way rather than a hard rock way, with Schoene's bass tone very deep, matching the sometimes sultry vocals of Neinhaus. The instruments of focus, other than Nienhaus' voice, are the guitar of Thurn and Schoene's bass. Except when they are in a solo setting, Pankoff's organ is back in the mix, and yet very much present. Lyrically, the album is fairly sparse, and without a lot of reading between the lines, or, in the case of "Pan-Am Flight 249," some context, they don't seem to make a lot of sense. But they don't have to, as the ear is drawn to how Neinhaus sang, not what she sang. The centerpiece of the album is the nearly 10 minute "Analogy" – the track from which the band took their name. It begins as a subtle atmospheric piece with just Pankoff's organ, but gradually fades in to become a full on rocker, bringing to mind The Who a bit. Of the core album's 7 tracks, this is the one that is, perhaps, the most proggy in nature, though it gets there by way of psychedelia. The watery organ work recalls Ray Manzarek's in tone a bit, as on The Doors' "Riders On The Storm." The Doors played extended, arty, pieces like this. In another passage, Thurn's initially delicate guitar lines recall Pink Floyd ("Us And Them" came to mind), before a sweet, but high-toned guitar takes the lead voice, playing in sad, melancholy notes. They follow this up with the upbeat, energetic "The Year's At The Spring," which made think of something from the early days of Jefferson Airplane, though Neinhaus doesn't sound like Grace Slick exactly, I could easily see Slick singing this way stylistically. Again, it is a showcase for Thurn, Schoene and Pankoff, but mostly Thurn, as he plays a brassy toned solo, leaned into a distinctively Hammond organ solo from Pankoff. Haven't mentioned drummer Nienhaus much, but his performance is solid throughout, keeping everything moving along. Nienhaus's story has a tragic ending, as he committed suicide in 1984 while he was in the end stages of his fight against AIDS. The other thought that came to me as I was listening to Analogy was anachronistic as I thought of The Red Masque during the dark, gloomy, and some times funereal, "Dark Reflections" as well during the equally dark and gloomy "Pan-Am Flight 249" -- whether this song is in response to some specific incident around the time, I don't know. I did "Google" it, but found only references to the track in the tracklisting of various reviews of this album. This comparison was not just in the vocals of Jutta Neinhaus, which are richly ethereal and lilting, but rather in the whole vibe of each piece. Another of the album's highlights is "Weeping May Endure" which, aside from some brief lilting vocals from Nienhaus, is an instrumental with Thurn's guitars leading the way. Here, too, Pankoff's organ gets a moment in the spotlight. Once you "get past" finding some of vocals "flower child" like -- but pleasant to the ear -- and so very much of the 70s, you realize that the band combined all their respective talents to create a solidly good album. Produced by Aldo Pagani, who permitted the band only two recording days (all he was willing to invest), the album seems far from hurried or rushed. It's easy to see why this gem in it's original vinyl version is a sought-after item, potentially fetching US$1500. Good record. When i see the LP i´m surprised coz Jutta is amazing ....almost 40 years ago.